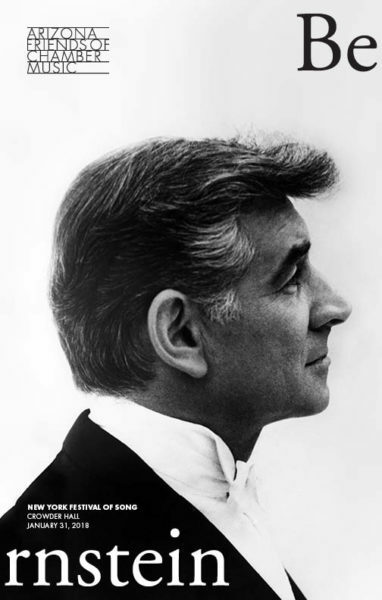 The hundredth anniversary of the birth of American musical polymath Leonard Bernstein is upon us, and, in collaboration with the Tucson Desert Song Festival, we proudly present emissaries from the New York Festival of Song, a center of exceptional, intimate vocalism, in an all-Bernstein program. The centerpiece is Arias and Barcarolles, his serious, late song cycle for two singers and two pianists, but the program will also be packed with his rambunctious earlier fare, including selections from his Broadway shows. Crowder Hall is located inside the Music Building in the Fine Arts Complex at the University of Arizona, near the southeast corner of Park & Speedway. Parking, including handicapped spaces and an elevator, is available in the Park Avenue garage, located on the northeast corner of Park & Speedway. You can pre-pay–take your parking ticket immediately to the garage cashier after parking. Cashier is located on the east side of the main level. Parking fee will be $4 (cash only). After the performance, insert the parking ticket at the gate to exit.